In March, Abdul-Karim Krymskii, the ethnic Crimean Tatar naib (deputy amir) of Jeish al-Muhajirin wal-Ansar’s (JMA) ethnic Chechen Kist amir from Georgia’s Pankisi Gorge, Salahuddin al-Shishani, gave an interview published on the JMA’s website Akhbar Sham in which he is highly critical of the Islamic State (“Interv’yu s Naibom Amira ‘Dzheish al’-Mukhadzhirin val’-Ansar’ Abdul-Karim Krymskii,” Akhbar Sham, 2 March 2015, www.akhbarsham.info/2014/03/02/15/). Krymskii is from Russia’s (formerly Ukraine’s) Crimea and arrived to the jihad well before Moscow’s incorporation of the peninsula into the Russian Federation. The JMA, sometimes referred to as the ‘Caucasus Emirate in Sham’ is tied, indeed an affiliate in Syria of the Caucasus Emirate (CE) based in Russia’s North Caucasus. 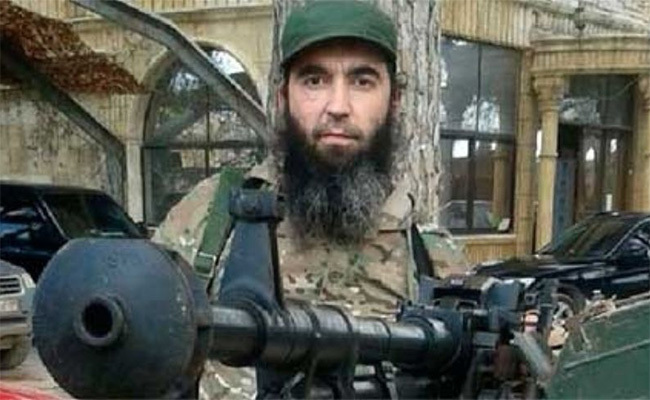 Salahuddin maintains his bayat to CE amir Ali Abu Mukhammed ad-Dagistani (born Aliaskhab Kebekov), which he had also given to Dagistani’s predeccessor, Dokku ‘Abu Usman’ Umarov, who dispatched him to Syria as the CE’s envoy to the Syrian mujahedin. Both the JMA and CE leaderships have taken the side of Al Qa`ida (AQ), Jabhat al-Nusrah, and other groups in the global jihadi revolutionary alliance in their conflict with an expanding IS. Amirs potentially controlling a strong majority of CE mujahedin defected to the Islamic State (IS, aka ISIL and ISIS) in December. Krymskii says that despite IS efforts to sow suspicion among the locals regarding the émigré fighters the population remains well-disposed towards the JMA mujahedin. Krymskii notes that IS mujahedin asked prior to their departure from the area whether JMA mujahedin were not afraid the population would retaliate against the JMA, but this did not happen. It is a suggestion perhaps that IS tried to blame its atrocities on the émigré JMA mujahedin. Krymskii condemns IS’s extreme takfirism. He recalls that when JMA and IS mujahedin were negotiating, the latter accused them of allying with infidels in order to fight infidels and agrees with his interviewer that IS kujahedin carry out sentences without trials and that those “young mujahedin” defecting to IS are aware of this. There are at least two Crimean jamaats fighting in Iraq and Syria. One is under Krymskii’s command and is a subunit of the JMA in Syria. A group broke from this jamaat creatind another, smaller Crimean Tatar jamaat, Krymskii Jamaat, fighting independently at present but perhaps seeking acceptance into IS.